Identifying your first aid trained staff is important for moral, general safety and OSHA requirements. 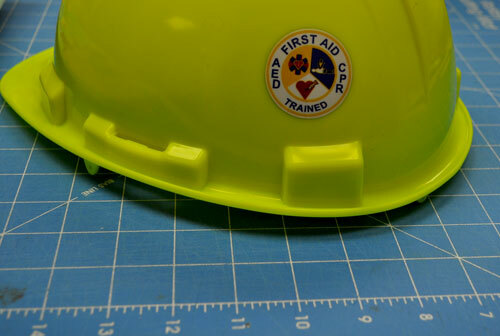 Our popular design for "First Aid, CPR and AED Trained" embroidered patch has been recreated as an attractive yet practical helmet decal for company safety programs, emergency response teams, CERT, Scouts and much more. Our advanced laminated material will stand up to years of use on the most "well loved" helmets, first aid boxes, tool lockers and clip boards.